With the unofficial end of summer approaching I wanted to make sure I got in at least one more session beer before the season changed and fall seasonals take over the shelves. This next one was a very timely gift from friends that just so happened to have a very relevant name. Description: Listed as a smaller, session version the brewery’s Green Diamonds double IPA, this offering features Galaxy and Amarillo hops. I gave it the usual snifter glass treatment, with a few leftover sips coming right out of the can. Appearance: It poured a hazy (but of course) golden-yellow body with some tinges of amber underneath a thin layer of white foam. Smell: Bursts of sticky sweet tropical fruit the instant the can was popped open. The aromas were more subdued in the glass, but pretty intense upon first opening the can. Taste: The taste continued where the smell left off, starting out with tropical fruits that quickly blended into a strong mixture of earthy and piney bitterness. Going into the finish the beer picked up more of a bready malt and grapefruit character that subtly changed the nature of the underlying sweetness. The hops lingered throughout, so much so that they left a lingering aftertaste. Mouthfeel: Medium sticky body with a moderate amount of carbonation. Hype Factor: I always hear a lot of great things about Other Half, but I so rarely get to try any of their beers. It sounds like their releases can be in pretty high demand as well, so additional thanks to the friends who hooked me up with this. Overall: An aggressively hopped beer that had all the taste and mouthfeel of a much larger DIPA. As such, I’m not sure how sessionable I would consider this on my palate, but it definitely was tasty. All I can say is that it’s bigger brother, Green Diamonds, must be one hell of a beer. I recommend this for sure if you can get it, though I wouldn’t plan on making a day out of drinking these unless you need to fulfill a serious hop fix with your session brews. This next beer sort of pushes the boundaries of what I had previously considered a session IPA. It will probably end up being one of the larger beers (relatively speaking) I drink as part of my summer series, but it’s advertised as a session beer so who am I argue? Description: Part of the brewery’s “Small Bird Series” of lower ABV offerings, this brew features a variety of fine malts and hops. You can check more of the details and the brewer’s notes on their website. For this review, I poured one of my 16 oz. 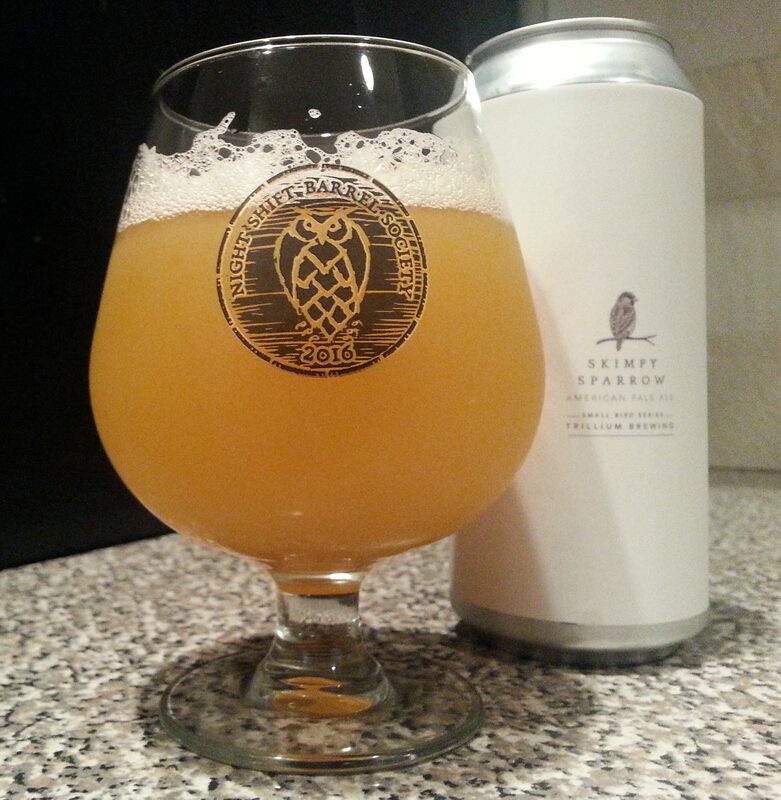 cans into a snifter glass. The four-pack of tallboys cost $13.20 which was pretty consistent with the brewery’s pricing model and fittingly the least expensive canned option. Appearance: Poured a cloudy straw body with hints of a darker amber/orangish color in the depths of the glass. It was topped off by a thick foamy white head that would slowly but steadily bubble away. Smell: Sweet tropical fruits with dank, piney hops in the background. Taste: The beer started out sweet and juicy with grapefruit and pineapple notes leading the way. These gave way to orange zest and a moderately dank pine resin finish. Refreshingly sweet and hoppy, this beer offered a ton of flavor without any particular aspect overpowering the other. Mouthfeel: It had a medium, fluffy body with a slightly less than moderate level of carbonation. The dry, sticky finish served to really accentuate the hop profile quite nicely. Hype Factor: There was a little bit for me. This wasn’t a special release or anything, but I’ve come to have high hopes for anything I bring home from this brewery. 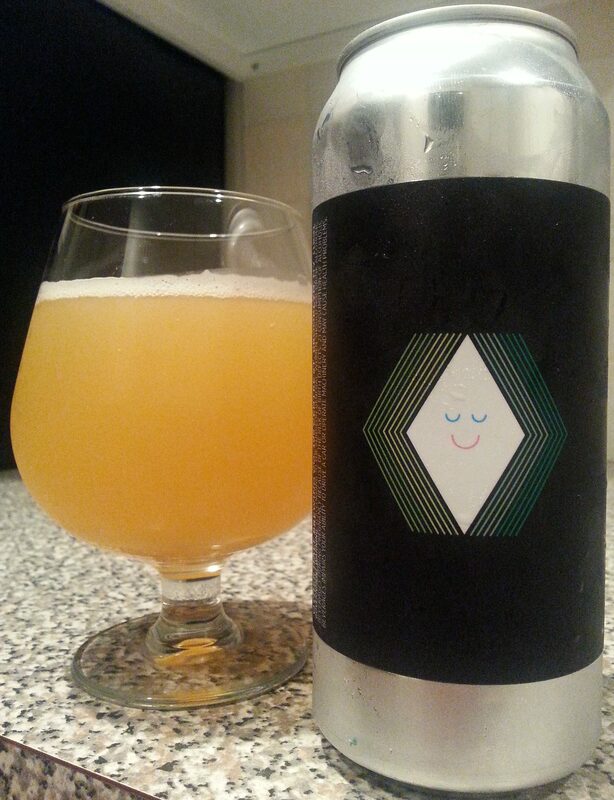 Overall: Another excellent beer from Trillium, one that kind of reminded me of smaller, lighter version of their Galaxy Dry Hopped Fort Point Pale Ale. Everything about it came together really well and I look forward to finishing off the rest of my cans. Last week it was my turn to pick out the Friday afternoon work beer again. It was pretty hot out that day, so my orders were to bring back something not too heavy. Fortunately I’ve been doing plenty of research on that sort of thing lately. Description: Described in some detail by the brewers here, this pilsner was dry hopped with Chinook, Citra, and Centennial to give an IPA-like quality. I picked up a six-pack of cans at a convenience store for $12.99, a price point I felt was reflective of location. The cans were pretty fresh at least, bearing a 6/10/2016 date stamp. We happened to have some pilsner glasses hanging around the office, one of which I put to good use for this review. Appearance: It poured a translucent, pale yellow/straw-colored body topped off by a plentiful foamy white head. The head eventually settled down somewhat, but did stick around for a significant portion of the drinking experience. Smell: Mild sweetness mixed with grassy and piney hops. Taste: Crisp, clean, and surprisingly hoppy, this beer was true to the brewer’s notes and a near perfect pilsner/IPA hybrid. Light bready malts, a touch of citrus zest, and a grassy, earthy hop bitterness all combined to make this one flavorful beverage. Each component had its place in giving the beer a light and refreshing taste that highlighted the best aspects of each style it aspired to. Mouthfeel: Medium bodied with moderate-plus carbonation. Suited the taste profile very well. Hype Factor: No hype here. Honestly, I decided on this brew because I needed to come back with something not too heavy and it seemed like the best option available even though I wasn’t quite sure I was in the mood for a pilsner. Overall: This turned out be an excellent choice, even at what I felt was a downtown price markup. 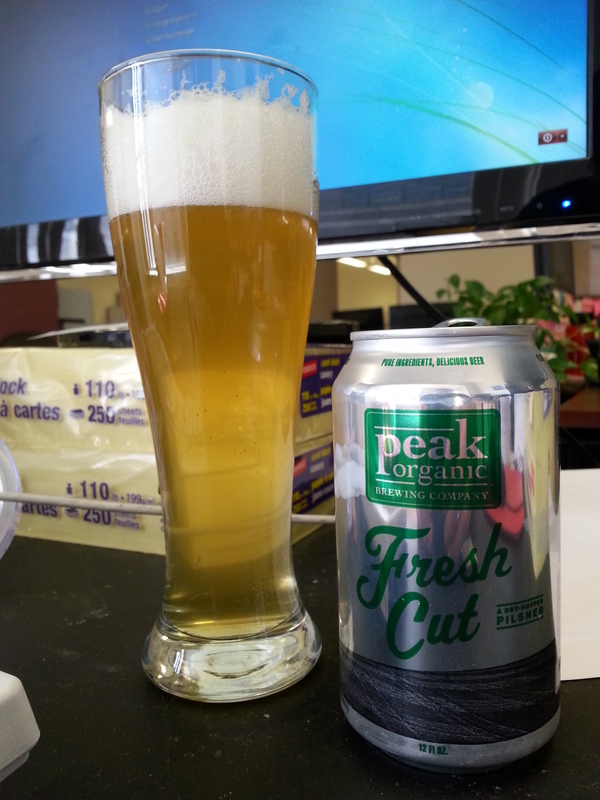 It was a really good, refreshing beer that delivered exactly what we were looking for at the end of a stressful summer day in the office. I think this would have been a solid pilsner on its own, but the dry hopping took the beer to another level by adding an extra dimension of flavor that complimented the base brew nicely. Satisfying pickup. I finally found a good time to open up that second growler from Bone Up Brewing Company I picked up the other day. After really enjoying the first one last week, I was eager to taste what this one had to offer. Description: The brewery’s take on a Belgian Wit, only made dark for, well, reasons. You can read up on the brewer’s notes and thought process here. For my side of this exchange, I opened up the sealed growler and poured myself a drink into a snifter glass. As with the previous beer, the growler cost $8.49 (plus a $2.50 deposit) and was filled on 7/22. I had my first taste of this beer a week later on 7/29. 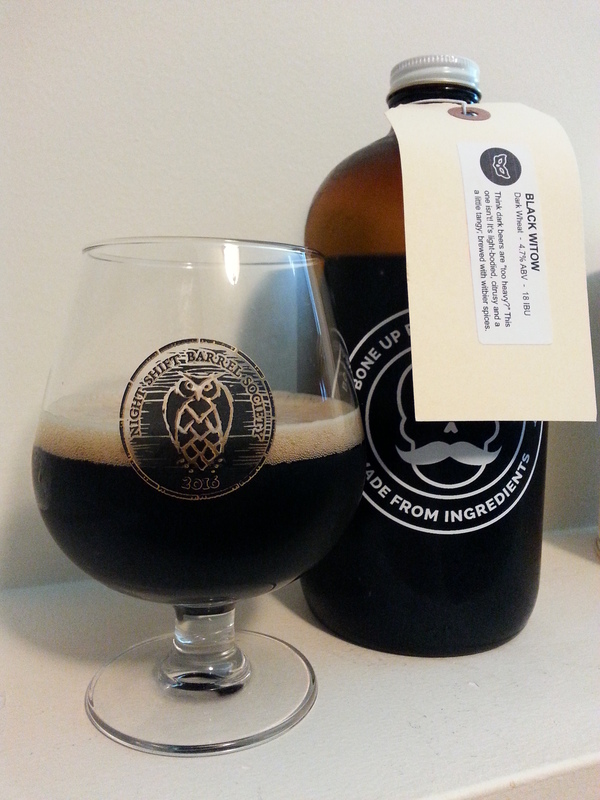 Appearance: Poured a dark black body with just about a finger of tan, foamy head. At a glance it was deceptively similar to many imperial stouts. Smell: Smelled a touch wheaty with a hint of zesty citrus fruit. Taste: Light and crisp, the beer featured toasted malts upfront before picking up some of the more expected characteristics of the style. Following the initial taste came a blend of orange zest, mild herbs/spices, and a wheaty/yeasty presence that picked up some banana esters on the finish. An intriguing and well-balanced blend of roasted malt and traditional wheat ale fixings. Mouthfeel: Medium bodied with a slightly more than moderate amount of bubbly carbonation. Feels nothing like one might have expected based on appearances alone. Hype Factor: No hype, just more curiosity. Overall: I liked this beer, but wasn’t really blown away. 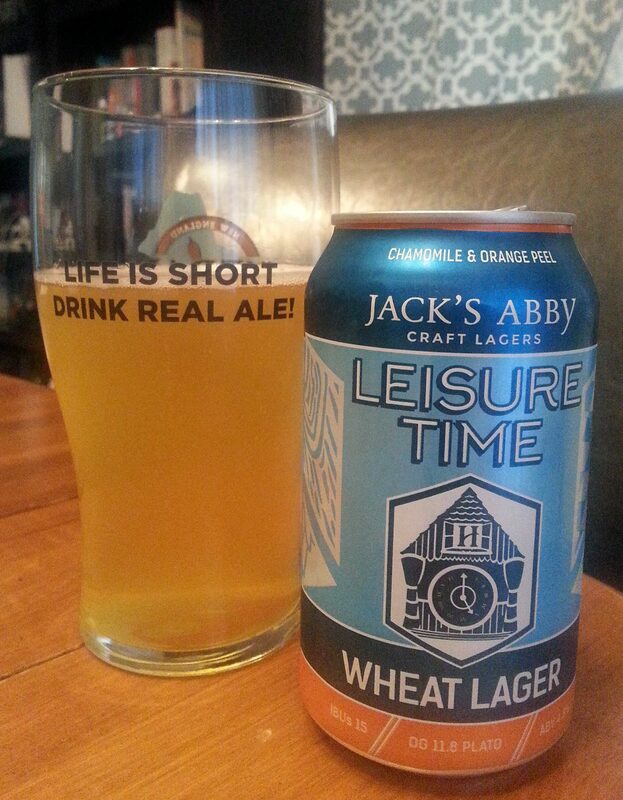 Perhaps I just don’t get overly excited by wheat ales. It was definitely intriguing and different, but I can’t quite put my finger on whether or not they did that for some higher purpose or the sake of being gimmicky (see again their quirky descriptions). Either way, based on my experiences with Black Witow and Key Lime White I would definitely try out more this brewery’s offerings, though preferably without having to acquire any additional growlers (I’ll have to look into that). I’ll also keep an eye out for when their taproom opens so I can experience what they’re about firsthand. So far, they definitely seem like another solid addition the local brewing scene on the north end of the Orange Line. 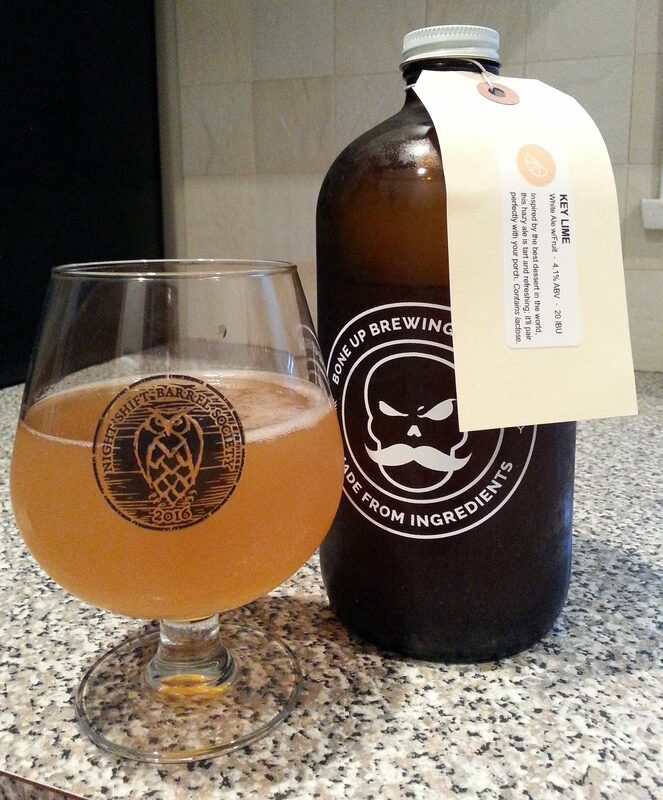 This time I am checking in with a session beer from yet another new brewery in my area, Bone Up Brewing Company. They’re not quite ready to open their taproom to the public yet (it is located just down the street from Night Shift), but they recently started a limited distribution of their beer to various bars and stores in the area. I had time to get over to the Medford Kappy’s the day after they got there most recent delivery, and I picked up two sealed growlers; one for now and one to check out in a few days. Description: Described by the brewers in some detail here through a quirky anecdote, essentially this beer was inspired by key lime pie. I kind of like the off-key descriptions the brewers give their beers (similar to Stone Brewing but without the direct aggression), though that sort of sassiness will only work in the long run if the beers back it up. Speaking of, I poured this sample from a sealed 32 oz. growler into a snifter glass. The growler was filled on 7/22 and I had my first taste on 7/24, so I definitely got to this while it was fresh. Cost-wise the growler was a pretty reasonable $8.49 with $2.50 deposit on the glass I imagine I can recoup eventually when the taproom opens. Appearance: The beer had a dark straw/light orangish body topped off with a fizzy white head that dissipated rather quickly down to nothing. Smell: Citrusy sweetness backed up by a yeasty and bready aroma. 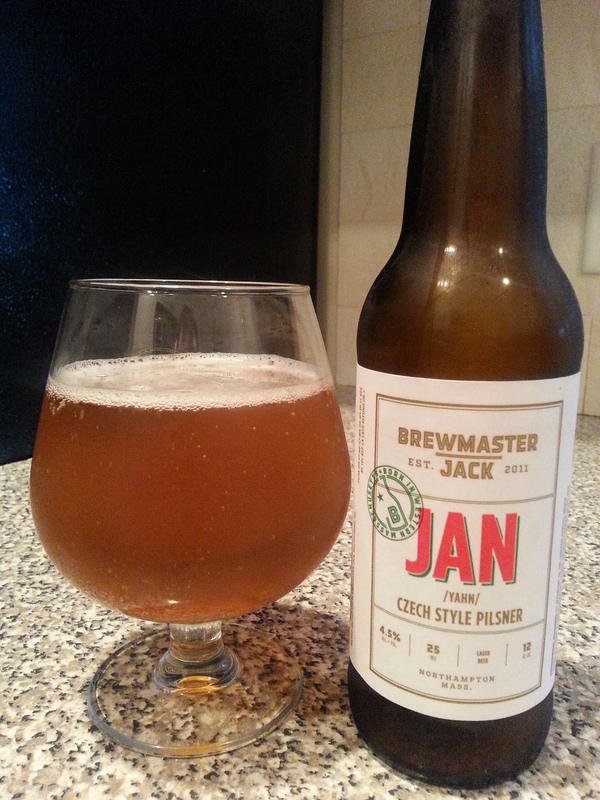 Taste: The beer started out dominated by tart citrus flavors and an aggressive lime zest. The lime mellowed out a bit as the beer sat for a few minutes, which allowed a subtle bready malt and ever so slightly peppery yeast presence to emerge. Mouthfeel: Medium bodied with a lot of lively carbonation at the start which served to accentuate the tartness of the lime. After sitting for a little bit, the carbonation simmered down giving the beer a slightly heavier creamy feeling. Hype Factor: Curiosity is probably the better word here. I was pretty excited to sample the wares of a new brewery that is setting up shop in my area. Even more excited considering the offerings available fit into my session beer theme. Overall: This was an interesting beer from which to get a first impression of a brewery, but it seems like this might be fairly representative of the brewer’s style. I think they did a good job with this one and came pretty darn close to their target here. The beer was very refreshing and definitely well-suited to drink in the hot summer weather. Leisure time, what’s that? Here we go with another session beer from a brewery with “Jack” in the name. Description: Listed on the brewery website as a lager brewed with “wheat and a blend of spices including lemongrass, coriander, orange peel, and chamomile.” I emptied a 12 oz. can into a pint glass for this review. Appearance: It poured a cloudy, semi-see through straw yellow body with a frothy white head that dissipated rather quickly. Smell: Slightly sweet, mixed with lager yeast and a faint bit of tea on the finish. Taste: A little bit of sweetness upfront, primarily in the form of orange and lemon zest. From there the beer picked up a wheaty, yeasty taste before finishing with a subtle mix of light malt, chamomile, subdued floral hops, and just a bit more citrusy sweetness. Really nice blend of flavors that complimented each other well. Mouthfeel: Just barely medium bodied with a decent amount of carbonation. Went down nice and easy. Hype Factor: No particular hype here, I simply picked this one up to get re-acquainted with a core offering from another one of my fantastic local breweries. Overall: Very tasty and really easy to go through quickly right from the start. It had a great blend of flavors and was both refreshing and relaxing to drink. I could see this being an excellent beer to have in quantity for some outdoor day drinking on a hot summer day. Nicely done, one of my favorite session beers so far this summer. This was a special beer for me. No, it’s not an elusive whale or some crazy Untappd milestone. This is the first I’ve had since my son, incidentally named Jack, was born last week. With sleep at a premium, let’s continue on with my summer of session beers! Description: Described on the brewery website as a light and delicate traditional lager made from their favorite yeast strain offering a “crisp, clean, and refreshing” taste. It came in a 12 oz. bottle which I poured into a snifter glass. Appearance: The body poured a nice golden amber color, topped off by roughly a finger’s worth of foamy white head. Lots of lively bubbles running up from the bottom of the glass. Smell: Sweet, with a light malt base underneath. Taste: Similar to the smell, the beer was sweet up front, with a bit of a tangy apple presence giving this flavor added prominence. Transitioned to grainy, light Pilsner malts with an extremely subtle hint of earthy hops towards the finish. The aftertaste was slightly tangy again, with light malt and yeast mingled in. Mouthfeel: Thin, light body with a pretty heavy level of carbonation. Happy little bubbles throughout. Hype Factor: Not a lot of hype attached to this beer, but it was consumed under some pretty special circumstances. It was also nice to open up a cold beer on a warm day after going without for a few weeks. Overall: Despite having a similar flavor profile to the brewery’s Stray Dog amber lager, a brew I was somewhat ambivalent about, I kind of liked this beer. Once again, I’m not entirely sure if the tartness was intentional or not, but it did work out pretty well in combination with the lighter malts. I’d drink this again, but wouldn’t go out of my way to do so. I think for this brewery I far prefer their more hop forward offerings and rye porter though. This next session beer is a little something I picked up at random as a Father’s Day treat. I’ll admit that it was the name and cool looking can that made this one stand out for me. Not always the best basis for selecting a beer, but something had me feeling confident about this one. Description: A session beer from a brewery in Connecticut I hadn’t come across before. 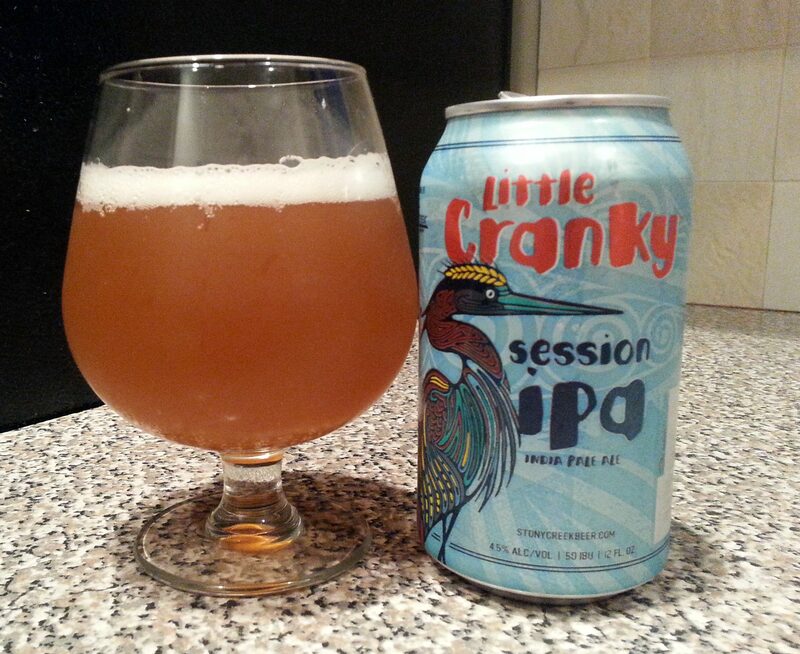 It is the smallest beer in “Cranky” series of IPAs, which you can find a bit more about here. I picked this up in a six-pack of 12 oz. cans that cost about $11. Canned on date was 03/22/2016. I drank the beer for this review out of a snifter glass. Appearance: The beer had a coppery, amber body with about one finger’s worth of foamy white head. Smell: Citrus fruit sweetness with a faint hint of bitterness in the background. Taste: Citrus fruits upfront, mostly orange and mango with a hint of lemon zest. Fairly light and resinous piney hops round out the taste through to the finish. Mouthfeel: Medium bodied with a moderate yet lively carbonation level. Really easy to drink. Hype Factor: No hype on this one, was just picking up something new that caught my eye. Overall: A pretty good beer, but perhaps a bit misclassified as an IPA. I found the bitterness level and taste profile more in line with an American Pale Ale, though perhaps we’re splitting hairs with this sort of distinction. Regardless of what you want to call it, this was an enjoyable little brew. It might not blow your mind, but I did like it and it succeeded in making me interested to try out the bigger beers in this series. My first porch beer of the year! I am celebrating the occasion with another session beer, this one with an offering from Brewmaster Jack. I’ve really enjoyed some of their beers in past entries, and was particularly impressed by Total Eclipse, their rye porter, when I had it after work the other day. 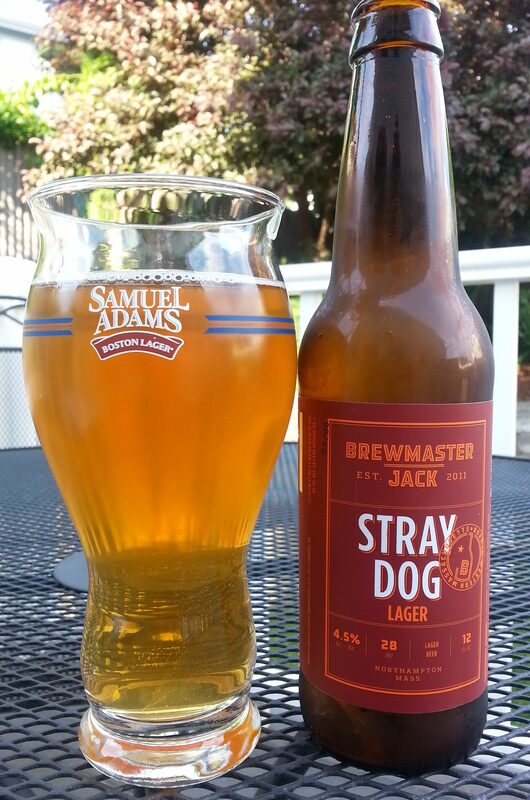 Sticking with my session beer theme, though, it’s the Stray Dog Lager that got the nod for this review. Description: Described by the brewers as a “distinctively malty” amber lager brewed with two row barley, crystal malt, and Munich malt. I’ve been feeling a need to diversify my choices in glassware lately, so I poured this beer into a Sam Adams perfect pint glass. Appearance: It had a cloudy golden/light copper body with a wispy white head. A steady stream of bubbles ran up the middle of the glass. Smell: Sweet, much more so than expected. A bit of lager yeast as well in the background. Taste: Upfront there was a surprising sweet, tart, and almost funky dark fruit character with a touch of lemon zest mixed in. Underneath the sweetness was a more traditional blend of light malts and lager yeast that stood out a bit more once the initial tastes faded a bit. For the finish there was a toasted malt character that picked up some bitterness as the beer warmed. There was definitely a sweet spot in terms of temperature where this beer tasted alright, but otherwise something seemed kind of off to me. Mouthfeel: The beer was pretty smooth. It featured a full body that felt on the thicker side of medium with a slightly less than moderate level of carbonation despite the aforementioned bubbles. Hype Factor: Just my own excitement. I’ve become a fan of this brewery and wanted to branch out and try a greater variety of their offerings. Overall: I was confused by this beer and wavered a little bit as about posting this review, mainly because I was not sure if the funky fruit taste I got was intentional or if I happened upon an off bottle. I looked up some other reviews to see what people were saying and since it didn’t seem to be totally out of line with what other people were getting (and a number of those people liked it), here we are. The beer was definitely a surprise, but not the kind I was looking for. Definite miss for me. With this coming on the heels of having really enjoyed the Total Eclipse porter, I was also a bit disappointed that this is the offering I had lined up to feature here. Live and learn. I’ll admit that this beer was a complete impulse buy. I did not know about this release until the morning it went up for sale and made a last-minute decision to see if I could pick up some cans during my lunchtime walk. Luckily for me, at the time I stopped by the brewery there was no line to speak of and I got in and out in the time it took to process my payment. Since session beers are going to be my running theme for the near future (hopefully more on that soon) I couldn’t have asked for a luckier trip. Description: For their first canned beer release, Trillium teamed up with Brooklyn, NY brewers Evil Twin to create what sounds like the ultimate session IPA in celebration of the first day of summer. As usual, the full details are available on Trillium’s website. The can I drank for this review was poured into one of my trusty snifter glasses and came in a four pack at a cost of $13. Appearance: It had a hazy golden/straw yellow body topped off by a fluffy white head. Smell: A juicy mix of citrus fruits and sweet-scented hops. Taste: Similar to the smell, the front end of the beer was packed full of sweet fruits; I got a mix of peaches, grapefruit, and perhaps a bit orange zest. The finish brought forth a dank, resinous, yet also slightly sweet hoppy bitterness atop a crisp grainy and biscuity malt presence. Bold and assertive throughout, this beer packed all the punch flavor-wise of a much larger brew. Mouthfeel: Medium bodied with a nice fluffy character to start, it took on a juice-like thickness towards the finish with some tingly bubbles from the moderate carbonation. Hype Factor: New Trillium releases always seem to come with a certain amount of hype and excitement attached. Not sure a session IPA commands quite the same levels as a DIPA three times its ABV, but this is beer appeared to be exactly what I have been looking for these days. It also seems like Eccentrica Gallumbits herself may have endorsed this brew judging by the label. Overall: An exceptional beer in any category, this is now my new favorite session IPA. I can’t believe they packed all that flavor into a beer that is a super mellow 3.3%. Once again, Trillium delivered an outstanding hop-forward beer that I am really glad I got a chance to try.